The 4-4-2 formation is the most commonly used formation in soccer. It’s consists of four defenders (a typical back line of fullbacks), four midfielders, and two strikers. The 4-4-2 works well whether a team is interested in attacking or defending, based on the situation. The roles of central midfielders and fullbacks vary depending on how much emphasis a team is placing on defense or offense. Fullbacks join the midfield players when on attack, providing an overlap run to get crosses into the penalty area. The fullbacks can then run into the middle to cover the two central defenders when the ball is being advanced down the wing. The back line players often have a close relationship and the more experience they have together the stronger the line becomes. This is one of the positives of the 4-4-2. A negative of playing with four defenders in a flat back is complacency. Fullbacks may want to take the chance of joining the midfield or even helping out in the attack. This can cause the remaining four midfield players and the two attacking players to be outnumbered and will ultimately goals will be hard to come by. The two strikers link up in play with the midfield players and the rest of the team. It is important that these players spread the defense apart to create space for the midfield players and fullbacks joining in the attack. These two forwards may play far up the field or can drop a little deeper depending on the need. In this regard the forwards in 4-4-2 formation are often interchangeable with the midfield players. This causes confusion for the opposing defense and can help open up a scoring opportunities. The main benefit of the 4-4-2 is that it’s simple! With clear player roles, it provides a basic foundation of defensive depth and the ability to attack in numbers. On defense, the four fullbacks and four midfielders can put eight men in front of the opposition, and cover the entire width of the field. If the defense pushes up high with the midfield, the opposition can be forced to stay within its own half. On offense, there are always options out wide and a strong presence up front to provide attacking options through crosses or long balls to the wings. Playing with two strikers can leave your team outnumbered in midfield. While one striker can drop back to help out, many strikers typically do not do this. Also, ff the wingers play out by the sidelines, the central midfielders can be isolated against teams that play three or four central midfielders. If a team has is playing a 4-4-2 and is not very well organized, a lot of space in front of the defense can open up. This forces the midfield to close down passing lanes and if they can’t, teams will have trouble defending opposing players in that open space. If you are new to coaching, the 4-4-2 is probably the formation that’s best to start with. Most players are familiar with it, and it can be used at all levels. As you begin to learn the strengths and weaknesses of your players, you will be able to determine which players fit the best roles in the 4-4-2. I am a also a huge soccer fan and currently playing in the Maccabi games in Israel. I am from South Africa. 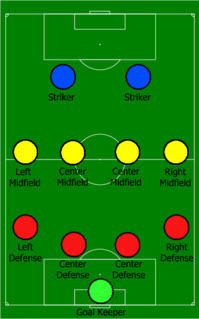 Your article has helped me immensely to understand my position and the formation that my team is using (4-4-2). Any extra advice would be grately appreciated. I’m happy I could help. You never mentioned, specifically, what position you play. The 3-5-2 features three backs two of which are wing fullbacks, who push up to support the midfield. Defensively the 3-5-2 matches up well against the 4-4-2, a formation many opposing teams play – it neutralizes the two strikers and the wingers. This is very good. The drawback is that when there are 3 fullbacks, they have to be very good, and good with each other. Three fullbacks is dangerous in any system and can leave your team vulnerable. The reason a coach will want to change from a 3-5-2 to a 3-1-4-2 or a 3-5-1-1 (or any other formation for that matter) can be due to many reasons. Such reasons include the completion and their strengths and weaknesses, match-ups with individual players, or sometimes even field conditions. First, we will look at the change to a 3-1-4-2. The strengths of such a formation include a dense midfield and a “point” person to help the 3 fullbacks to bring the ball forward. As for attacking, the “1” can be a freely roaming attacking player. Overall, this is a wide formation and good for wing attacking plays. Weaknesses of a 3-1-4-2 include: Your team needs to be very “tight” in their defensive positiong. Using this formation leaves little room for mistakes. As for the wingers, they are doing a lot of work defending and attacking so they could tire out quickly. The 3-5-1-1 is basically the same as a 3-5-2. There really is very little difference aside from a slight change of positioning of the two forwards up front.